Mobalytics Is the Most Powerful Analytics and Coaching Platform Available. Climb Higher! We’re in open beta — sign up for free account! How does Mobalytics help you become a better player? 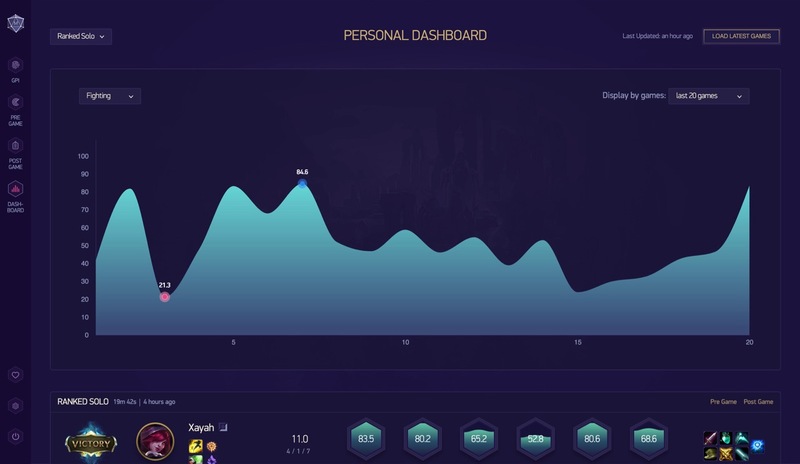 Mobalytics measures your in-game performance and gives you actionable advice on how to improve. 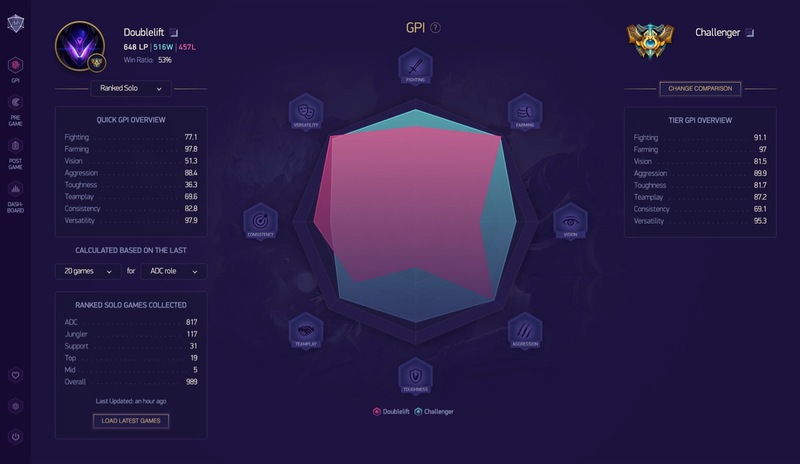 Mobalytics analyzes data from every game and gives you a personalized Gamer Performance Index (GPI) to visually help you understand your strengths and eliminate your weaknesses. Based on your GPI, our pros and challenger level coaches help you see beyond your KDA and provide you with a clear path to master the skills you need to climb. 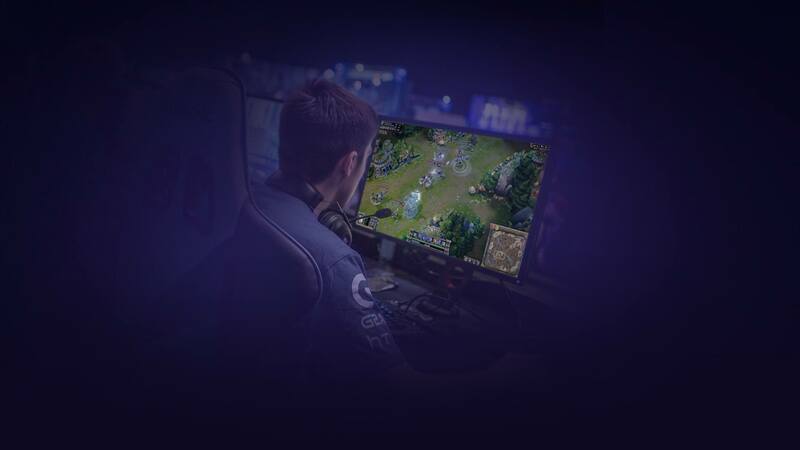 Our analysis tools and platform insights give you the confidence to face any match-up, challenge any meta and win more games. We have used our expertise in performance and A.I. to create powerful tools to help you climb. Your dashboard identifies your most critical goals and where you have reached on your journey. From there, you can access all the information you need to be successful. The Gamer Performance Index (GPI) uses machine learning algorithms to measure and evaluate your performance in eight crucial areas: Aggression, Consistency, Farming, Fighting, Survivability, Teamplay, Versatility, and Vision. The results are presented in a visual diagram so you can immediately identify your strengths and weaknesses to focus on specific aspects of your gameplay and improve as a player. Like a coach before a big game, our Pre Game tool gives you a strategic pep talk before your match begins. 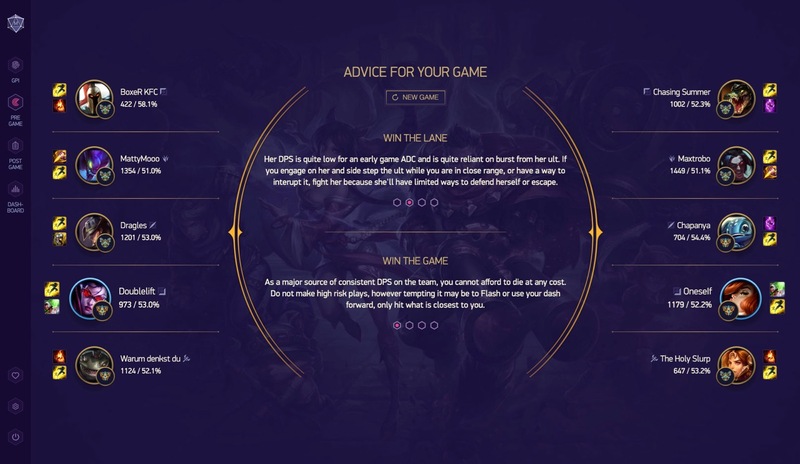 This feature not only gives you specific recommendations for playing against champion matchups and team compositions but also marks players with play style badges that point out helpful details about the summoners you’re playing with and against. Many personal statistics websites give you numbers without context, and I find it very hard to understand and apply what their numbers were telling me. However, your website told me in plain English that I am not aggressive enough -- and while my deaths are low, my contribution to the team was low as well. So last night I made an effort to be more aggressive during the game and it paid off. From clicking the icons and seeing what it says about me so far, it seems incredibly detailed, but really user-friendly. It's not just "CS better" or "git gud" type of stuff either. What's scary is how accurate the analysis is, all the things I struggle with are being picked up immediately. I signed up for the website because it looked and sounded amazing for what I wanted (which is to improve). The fact that it's actually unique and helpful is fantastic. I've tried several other websites and nothing is as specific or helpful. The GPI system helps create a whole different angle to look at yourself. Normally you just see raw stats on sites and maybe how well you are doing compared to others, but this system makes categories that you can relate to real skills. It just helps make that digital to analog conversion that other places don’t offer. Are You Ready to Climb Higher? Sign up to get access to the Mobalytics Open Beta. No worries! We respect your privacy and won’t share your email.